Extra-vision counter offers a full 35" of showcasing height! Four 20-watt halogen side lights illuminate displayed items! Floor levelers ensure stability on uneven surfaces! 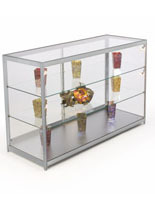 This glass counter is part of the Essentials Line of showcases. 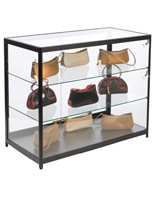 An Essentials showcase, glass counter offers users a centralized location to store and display expensive or fragile merchandise, with just the right amount of style and extras. 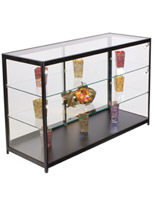 This glass counter is perfect for department stores, theater or business lobbies, hospitals, schools and more. 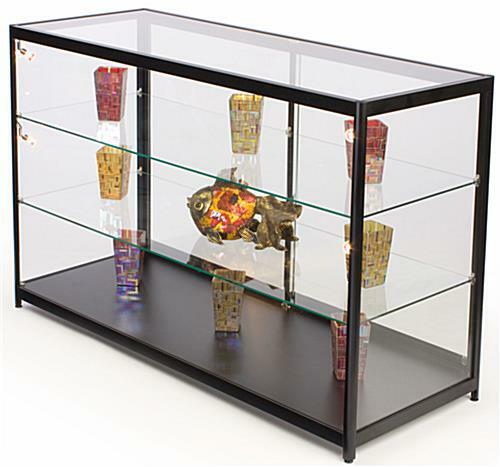 The glass counter offers users a fully functional and well-built showcase, without the high price tag of "top of the line" displays. 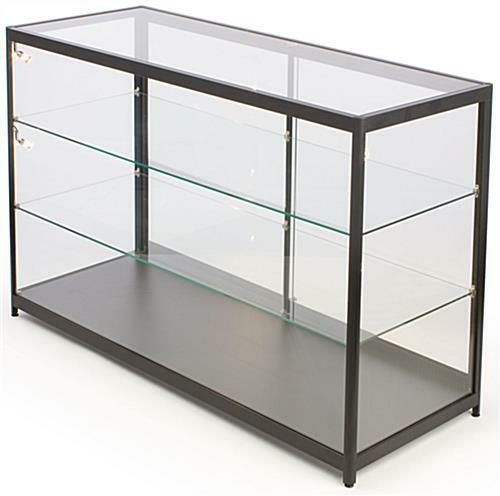 This glass counter, also known as a display counter, is crafted from tempered glass with durable aluminum extrusions to last for years. 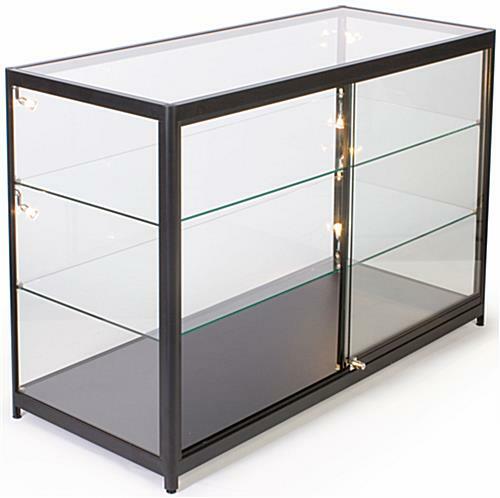 The tempered glass construction of this glass display counter offers a safe alternative to traditional annealed glass, as tempered glass tends to be stronger and if broken, will break into small, manageable pieces. Other features of this display counter include: four 20-watt adjustable-orientation halogen lights, floor levelers, a security lock, and an easily accessible on/off switch (located just inside the sliding doors). 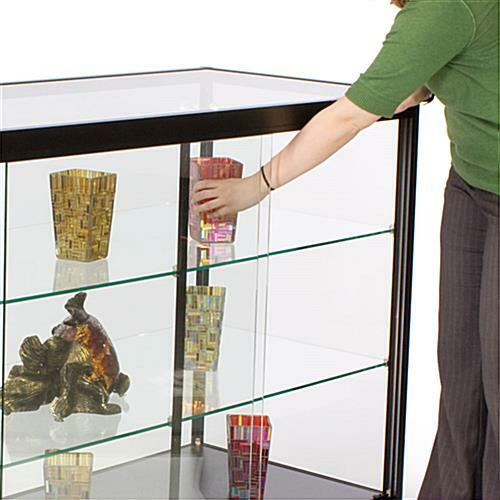 The shelves of this glass counter are even height adjustable to offer many display options! 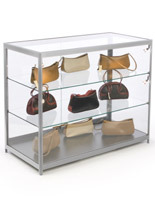 Full size rear sliding doors offer easy access to displayed merchandise. Ships fully assembled. Good quality solid case. 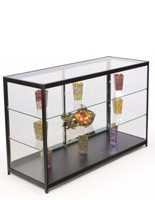 A centerpiece used to display handguns and accessories in our new remodeled store. Mike, thank you so much for taking the time to share your photo and write this great review. 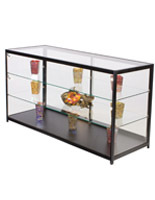 This display case looks great in your newly remodeled store. We hope you shop with us again soon!